If you are missing teeth in your mouth that makes it difficult to speak, eat, or make you uncomfortable, dental bridges may be the answer. Many of our patients who come to us with missing teeth are not candidates for dentures and wonder what the most appropriate solution may be. Our Waterford dentist at Dr. Taylor's Family Dental Center can work with you to help determine if dental bridges are right for you and if so, explain the process so you understand what to expect. Please call us at (248) 681-8100 to make an appointment or to learn more about dental bridges. Dental bridges are a tool that can be used to bridge gaps between missing teeth. Typically, they are made by creating two bridges on each side of the gap and an artificial tooth is cemented into place using your surrounding teeth as support. 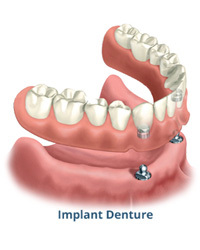 Since dental bridges are permanently cemented, they cannot be removed like dentures can. In order to be a candidate for dental bridges, we will need to determine if your surrounding teeth are strong enough to support a bridge. Gaps in your mouth caused by missing teeth can lead to a variety of issues, including shifts in alignment, speech disorders, and tooth decay. Having a dental bridge placed can help to prevent these problems from developing and improve your quality of life. Every mouth is different, and at Dr. Taylor's Family Dental Center, we create dental bridges that are customized for your individual dental needs. Would you like to learn more about our dental bridges in Waterford? Contact us now.